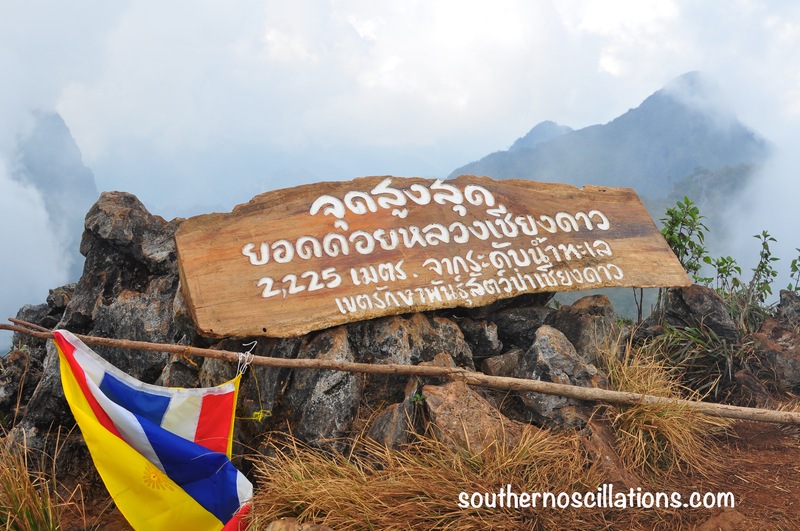 What: Hiking Doi Chiang Dao (2225 metres), the 3rd highest mountain in Thailand – beginners/intermediate. Where: Chiang Dao, 72km North of Chiang Mai, Thailand. Budget: 200 baht of park entrance fee + 30 baht per vehicle. After days of amazing and successful climbing we moved further north, leaving Crazy Horse with the feeling of having accomplished our goal for 2014. Thanks to the people from CMRCA in Chiang Mai who pointed out to us the possibility of hiking Doi Chiang Dao in the village of Chiang Dao. Hiking sounded great as our upper bodies were starting to feel sore from multiple days of climbing; plus, the idea of sleeping at the foot of a mountain without visiting the top is unbearable in our case and would have left us with itchy feet and thoughts of regret. Arriving at the village without any reservations we thought it would be easy to find a nice, comfortable bed. Unfortunately all the recommended places were full and much more expensive than expected. But, never let yourself be fooled by those expensive expat-oriented places that appear in the guidebooks, the best view in town is at Baan Suan Bon Resort where for 600-800 baht you can rent a bungalow with breakfast included in the middle of a splendid garden surrounded by the Daen Lao Mountain Range at 5 min walking distance from the village. Chiang Dao is a small village where not much happens. Foreign visitors go there mainly to visit the hot springs and cave. But, as we saw for ourselves, most tourists there were Thai people coming for hiking. There are not a lot of options for eating and things close early! We skipped the famous Chiang Dao Nest, Chiang Dao Nest 2 and Malee’s, despite their good reputation and the fact that they are cited in every single guide, preferring to eat on the street. That’s how we discovered the lady on the other side of the ditch – past the tiny bridge and the rivulet on your left. The tables are on wooden platforms and it does not look like a restaurant. As a general rule in Thailand I have often found the street food better than restaurant. At 2225 m elevation, Doi Chiang Dao is the 3rd highest peak of Thailand. The hike starts at about 1100 metres. We planned our hike based entirely on the information we found on blogs and forums. It is still not clear if you can or cannot hike the mountain by yourself or if you have to hire a porter and a guide – which are both useless in this case. We were told at the CMRCA that you don’t need a guide as long as you do the hike in one day. If you wish to sleep on the mountain, you have to hire a guide and porters and go on an organised trip. In my opinion despite the fact that it makes it a fairly big hiking day, it is unnecessary to sleep on the mountain. Once you have found the car park (about 7 km passed the park checkpoint), the trail will be on your left identified with some sticks. Nobody asked us to see our tickets or anything. After 3-5 min you should pass some kind of wooden gate; if you see it you are on the right track! We left the car park around 9am. 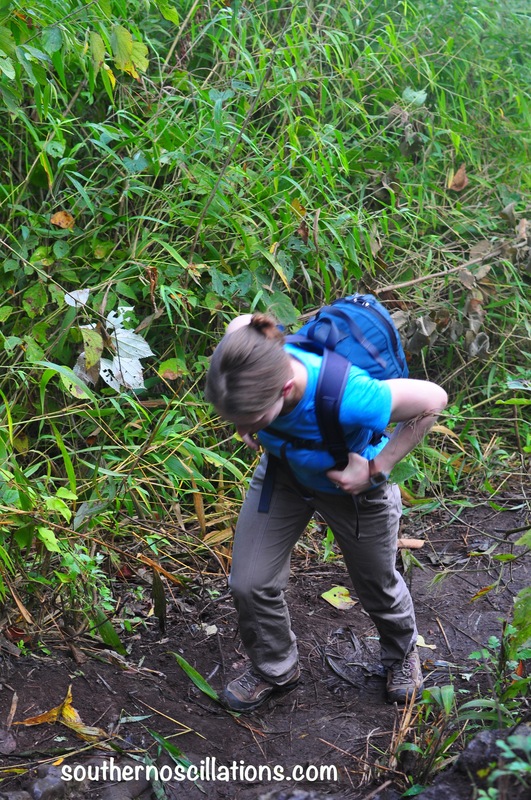 The first 45 min were the most difficult part of the hike: steep, muddy and slippery. We did it as fast as we could, passing several porters. Even if it was the dry season the dew made the ground and vegetation quite wet. I was happy to be wearing proper hiking shoes and long pants. I would not recommend wearing sneakers and certainly not flip-flops – it’s impressive though how all the porters wear simple plastic imitation Crocs with socks. Just remember: if you can hike the first 45 minutes, the rest will be easy! Turn left at the sign! From there, the hike was quite steady and easy going. We were surprised at the amount of people we passed and a little disappointed by the amount of rubbish on the way – toilet paper, poopoo spots here and there, and bunch of cigarette butts – come on smokers this is wrong… We did leave the car park a bit late and I regretted not leaving at 7am as planned. It was a bit more frequented than expected; this hike is definitely very popular among Thai hikers especially during the New Years holiday period! The nature was very beautiful. We spent the rest of the hike surrounded by mountain peaks with few clouds and the sound of birds. Banana trees were everywhere and bamboo trees were squeaking all along the way. After a little more than 2 hours we finally reached the campground, about 200 metres below the summit. Much closer to the top than we had expected, the campground consists of a big field at the base of the summit with lots of porters and guides. It was in fact quite busy with groups of people cooking and listening to music while others were starting to head down. Lots of porters with incredible amounts of extremely heavy stuff were coming and going, making me feel happy to be doing the hike in one day. I am a little antisocial when camping and expect to be away from all civilization… I am of a traditional style camper; in my book, ghetto blasters are strictly prohibited in the wild! 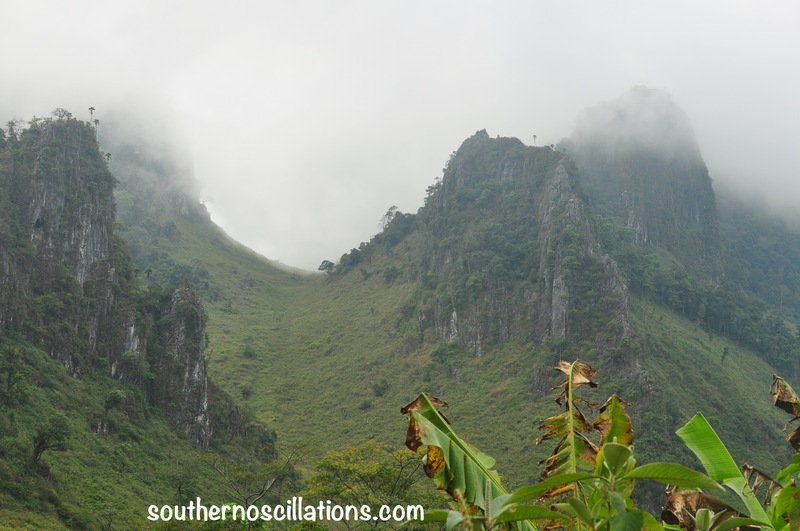 If you are like me, then avoiding the “campsite” and doing a one-day trip up and down Doi Chiang Dao is definitely a better choice. The descent was pure fun; we even ran a little to make it quicker. Doing it in a day or two ? We are both in good shape and love hiking. We were coming back from a week of rock climbing and despite being a bit sore and tired we were able to do the hike in 6 hours – we walked quite fast and got lost on the way down adding a good 45 minutes. The choice of doing it in one day or as a 2 day organised tour should depend on your level of fitness and experience. We saw all kind of people doing the hike – some seemed to enjoy their experience some looked like they were dying! In my opinion, I think it’s reasonable to say that an active person can totally do it return in 8 or 8 1/2 hours. It’s a long day of hiking. In case of doubt, 2 day trips are being organised from Chiang Mai including transport and food. Salut Marianne, je voulais que tu sache que ton blog est très intéressant et tres poétique ! le matin j!aime bien me laisser voguer au gré de tes merveilleuses escapades ! Ton anglais est Impecable !! Wow je ne te savais pas aussi articulé pour cette langue ! je t encourage a continuer ce blog et de poursuivre tes explorations ! Bravo !!! the post is very interesting and it was a useful read for me as I am going to climb Doi Chiang Dao in a month. 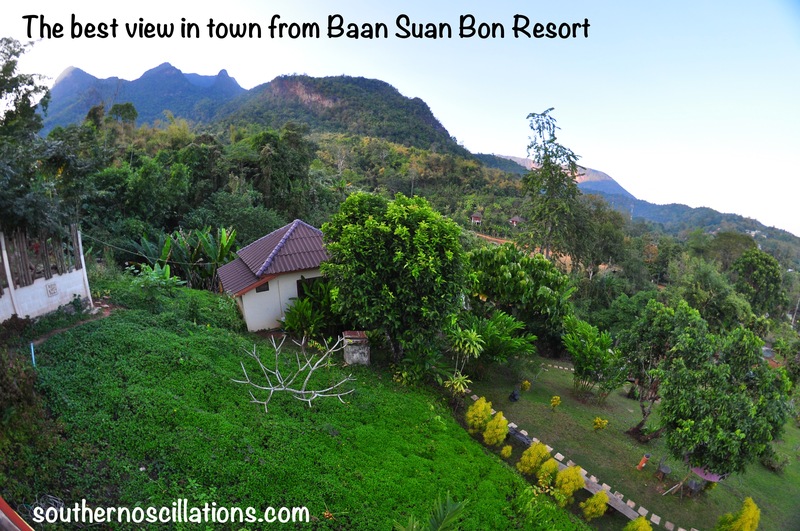 Can you provide contact for baan Suan Bon resort? Looked like a nice place to stay, as we will spend three-four days in the area. Thank you! Ok regarding Suan Bon Resort this is the kind of place we found totally randomly. I don’t have any contact for this place and it seems like they don’t have a website or any way to call them. I would recommend you go to the village of Chiang Dao and ask around! I am pretty sure that people will know them. The resort is located on the left side of the road when you enter the village via the main road (I think it’s called Moo Rd. If you pass a tiny bridge you have been to far). Good luck and hopefully you will find the place!